Yesterday, it was confirmed that Girl Meets World would not continue for a fourth season. Now, creator Michael Jacobs has revealed what would’ve happened on the cancelled Disney Channel TV series, TVLine reports. The Boy Meets World spin-off followed the family of Topanga (Danielle Fishel) and Cory (Ben Savage). The cast also included Rowan Blanchard, Sabrina Carpenter, Peyton Meyer, August Maturo, and Corey Fogelmanis. Disney Channel cancelled the show after three seasons earlier this year. What do you think? Did you watch Girl Meets World? What would you like to have seen happen in season four? 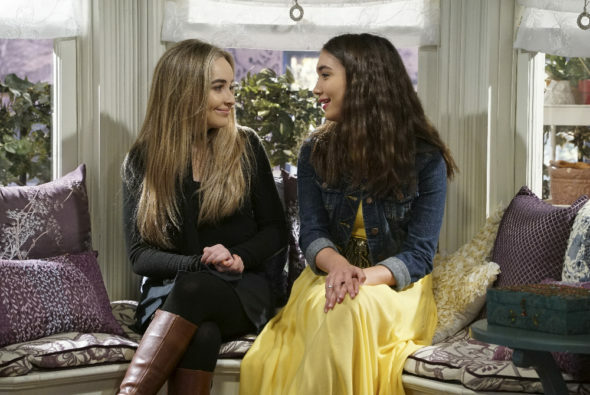 I watched girl meets world every week with my daughter, we love this show and how it shows us that friendship and family are very important to have in this world. Please bring back girl meets world on Disney or have another channel pick it up for another season. I love their friendship on the show. Family and Friends are really important and they showed us that. We don’t see that in shows that we can watch as a family because their are not many left. BRING back Girl Meets World. WE LOVE that show and don’t want to say goodbye. Yes I would keep watching it. But we will NEVER know now. Thanks to Disney Channel. Thank you for taking a good family off the air. It was the best! !